We were in an old building that was being cleaned out. The owner died recently, both his sons has already passed away, so the county got the building. They had just had an estate sale last weekend. 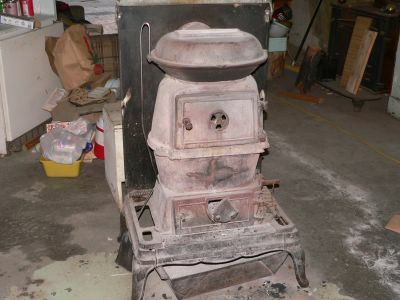 This old stove used to be in a railroad office. We got acquainted with the older man that was hired by the county to clean to place up, he took us through the building showed us a lot of interesting things. Skid stayed outside and visited with some guy he met. So between all of us, we learned a lot of history. A Morman Cricket on the street in Austin, NV. Another interesting building in Eureka, NV.